Encompassing Egypt’s greatest highlights and a three-day luxury Nile cruise, this adventure enhances a wide variety of included activities through whom you’ll gain a greater appreciation of the region’s history and archaeological finds. Discover the secrets of the Great Pyramids and explore the Valley of the Kings, then meet local people and share a traditional meal. A combination of air-conditioned transport and domestic flights will get you to the sights – and your comfortable accommodations – quickly and conveniently. From ancient history to bustling modern Cairo, embark on an incredible journey to the very heart of Egypt. Arrive at any time. Arrival transfer included. Join the group in the afternoon for a walking tour of Khan El Khalili Bazaar district. Overnight at Mercure Cairo Le Sphinx Hotel (or similar). Embark on a guided tour of the Great Pyramids of Giza and the Sphinx, along with visiting Memphis and Sakkara. We begin with one of the key highlights of any visit to Egypt, the Great Pyramids of Giza. While once located in remote desert, they now touch the suburbs of modern Cairo. Also visit the mysterious Sphinx, with its lion’s body and man’s face. Following this, visit Memphis, the ancient capital, and Sakkara, the vast ancient burial ground. Catch an early morning flight to Luxor. Enjoy an excursion to the magnificent temple of Karnak and explore the Luxor Temple or museums. 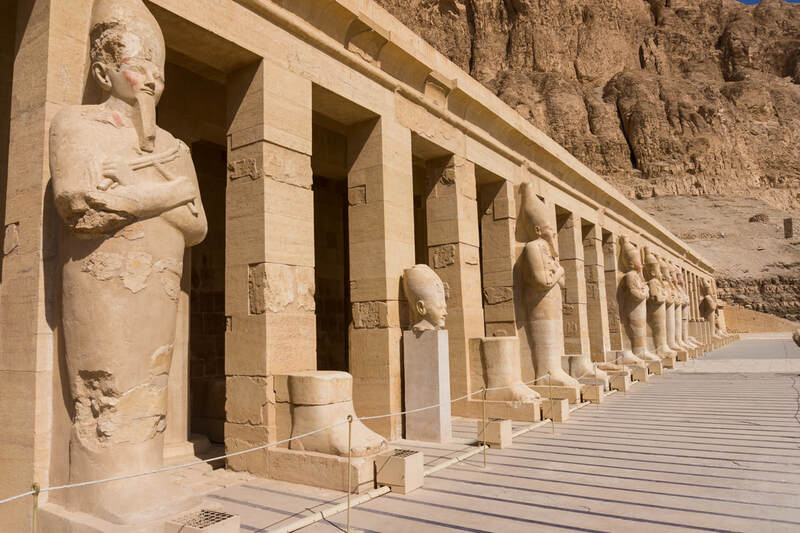 Visit the Colossi of Memnon and enjoy guided tours of the Valley of the Kings and Temple of Hatshepsut. Enjoy a hot air balloon ride over Luxor. Our day starts with a visit to the exciting ancient sites located on Luxor's West Bank and the famed Valley of the Kings. View key sites and opt to visit the the Tomb of Tutankhamun, whose treasures you saw at the Egyptian Museum. Enjoy the sites from above on a hot air balloon ride. Overnight on the Luxury Nile Cruise Boat. 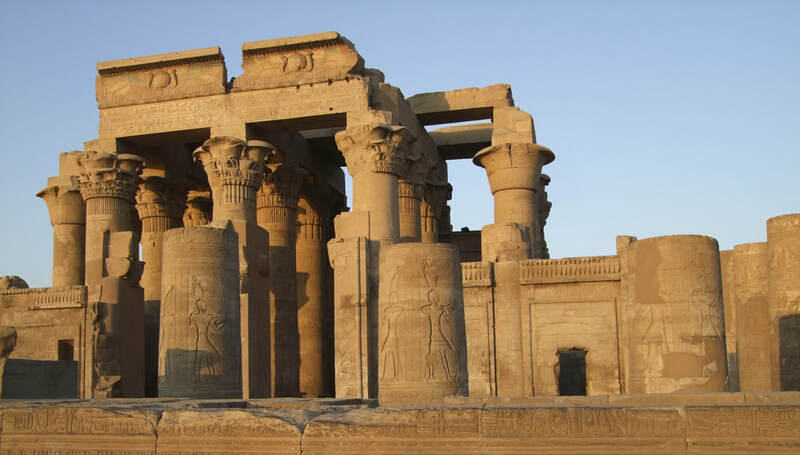 Spend 4 days floating down the Nile on a luxury river boat with guided tours of Kom Ombo and Edfu Temples en route. In between excursions, relax on the outside decks with a drink, watching the passing desert sands. Following breakfast, enjoy a visit to Kom Ombo, a temple dedicated to Sobek the crocodile god. It still contains an ancient mummified crocodile. 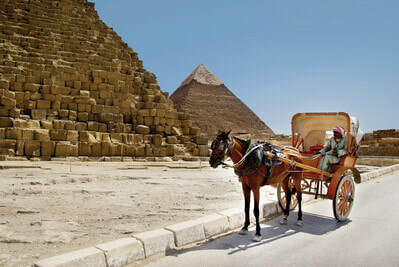 Enjoy an excursion in Edfu, travelling by horse-drawn buggy to visit the very well preserved Temple of Horus. ​Overnight on the Luxury Nile Cruise Boat. Enjoy a visit to the High Dam, the Old Dam, Philae Temple and the Granite Quarries. 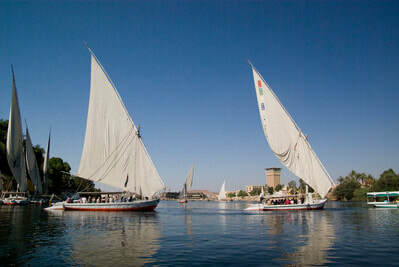 This afternoon, board a local boat, known as a felucca, to take a trip along the Nile. Depart the Cruise boat and take an early morning drive to Abu Simbel. Visit the famed temples of Abu Simbel before flying back to Cairo. Enjoy an excursion to the magnificent temple of Karnak. In the afternoon, use free time to explore the Luxor Temple or museums. Catch a train to Alexandria and visit Pompey's Pillar, the Catacombs and the Alexandria Library. After breakfast, we'll catch a train to Alexandria and explore all of the incredible sites this ancient city has to offer. Founded by Alexander the Great around 331 BC, Egypt's only Mediterranean city is characterized by a distinctly European atmosphere and a refreshing sea breeze. Overnight at Mercure Cairo Le Sphinx Hotel. Deposit of $800 per person holds your spot! ​Land-only pricing based on sharing a room is $1,895 per person. Alexandria extension is an additional $150 per person. Prefer to have your own room? Contact me for pricing details. Want to join the trip but don't have a roommate? Let us know and we can help match you with one. Interested in extending your trip? We can help you plan that as well. ​Contact Rene at 866-869-1760 or rene@grandexplorations.com.